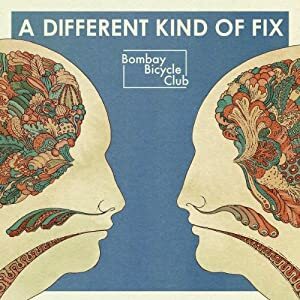 This BBC is Bombay Bicycle Club: a prolific, young gang. Jack Steadman, Jamie MacColl, Ed Nash, and Suren de Saram began jamming in high school, and are soon to release their third full-length studio album. Crazy thing is, this is likely the first year the boys are able to drink (legally) on their US tour! While last year's Flaws was acoustic, A Different Kind of Fix features catchy electric guitar hooks, atmospheric layers of heavy cymbals / percussion gizmos, and a strong, structural presence of bass and keys. The opening track is a sleepy awakening of interweaving themes, appropriate both toward the lyrics and song title. After an impenetrable wall of synth on "Bad Timing", "Your Eyes" adds interest with a monophonic relationship between the guitar and vocals. A sophisticated euphoria very much resembling HTDAAB-era U2 shows itself in "Take the Right One", while "Beggars" is an opposite sort of joyful, with handclaps, subdued jangles, and accidental-ridden vocal lines. The staccato texture of "Leave It" makes it a it of a one shot- either you like the repetitivity or not. Following track seven, the album transitions into a mellow second half, ending with hymnlike "Still". It's a beautiful, airy, piano-based piece, tastefully recorded. But wait, there's a bonus track in "Beg" that'll satisfy your pleas for more summer's end jangle. Personal favourites? "Lights Out, Words Gone"; "Beggars". preorder on iTunes 01 "How Can You Swallow So Much Sleep"
04 "Lights Out, Words Gone"
05 "Take The Right One"
There's some happy, laidback moderate music- it'll be autumn shortly for us northern hemisphere people, but vocalist Jack Steadman sings with a soft, hazy sheen that is just as much budding spring flowers as shedding trees. The quartet visits Toronto on September 17th, with Two Door Cinema Club and The Lonely Forest at the Kool Haus. Get your tickets here. It's a very complimentary lineup; those were going to be my LIYLs, actually. I strongly recommend it if you're in the area, having a fancy for all three bands myself (particularly The Lonely Forest, but I'm undecided between this show and the Mother Mother show on the same night. Don't you hate when that happens? And if you're into filmmaking, how's about making BBC's music video for "Lights Out, Words Gone"? The contest deadline is September 14th, so get to it before school starts!